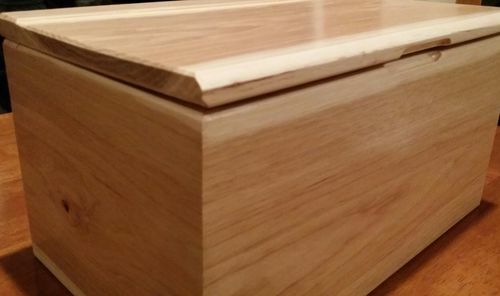 I made this hickory box and was really happy with how it turned out. After almost a week after I finished, I noted a gap had developed in the front where I had a good fit originally. As can be seen in the picture, the lid bowed. I now see the grain on the end and am guessing I should have cut the board into three sections and reversed the middle and glued them up. I am considering trying this yet (taking the lid off and doing the cuts and glue up). Before I attempt this, are there any other options that I should consider? I may just leave it as is…although it will bug me to see that gap! WE made benches from a big slab of honey locust that was very POLITICAL ==(CROOKED). We made a frmae that does not show from old bed steel and using screws from the bottom up about 2/3 of the depth of the bench and spaced quite close together—maybe 3 to 4 inches apart and very tightly scrwed them in with pilot holes to prevent splitting. This was about 5 years ago. They are outside but semi-shelteered in the NW OR climat and still have not twisted up. Hope this helps the box is very nice. BB1, if you did the cuts and gluing that would work except your top would then be two blade widths smaller. You could compensate for this by inserting two thin strips of another color wood. Your top would then be a work of art… Also, you don’t need biscuits, rub joints would work just fine. You didn’t finish both sides of the lid the same. The inside of boxes has less airflow than the outside and that sets up a differential in moisture that causes warping. BB1, if you did the cuts and gluing that would work except your top would then be two blade widths smaller. You could compensate for this by inserting two thin strips of another color wood. Your top would then be a work of art… Also, you don t need biscuits, rub joints would work just fine. I had not considered the loss of wood due to the cuts – thanks for the reminder on that! Not sure if this will end up being a “work of art” but I appreciate the idea!! You didn t finish both sides of the lid the same. Actually I did finish both sides at the same time. The wood “moved” days after I had finished with 4 coats of poly on both sides. 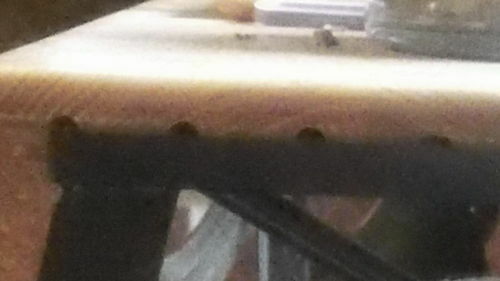 Having now looked closely at the board, I see the rings are basically looking like a smile curving upward and the board just had to move even though it was nicely flat during construction and when finishing. An easier fix would be to put a cleat on the inside of the lid going across the grain. This would pull the lid back down flat. The lid doesn’t look too thick so I don’t think it would be hard to pull it flat. You could make it out of a different species, walnut or something, for a little “visual interest”. Unfortunately, thin pieces of plain sawn wood with grain like that usually warp. The piece is nice looking but it warped. Thank you for the suggestion. Followup question…the lid is about 3/4 inch thick so how would I determine the optimal cleat size? Would you suggest one to each side? An easier fix would be to put a cleat on the inside of the lid going across the grain. This would pull the lid back down flat. The lid doesn t look too thick so I don t think it would be hard to pull it flat. You could make it out of a different species, walnut or something, for a little “visual interest”. I would agree with Scott M. cleats across the top on the inside. You may have to play with them a little. I have done this on tables that were badly warped. Flat might not be enough. 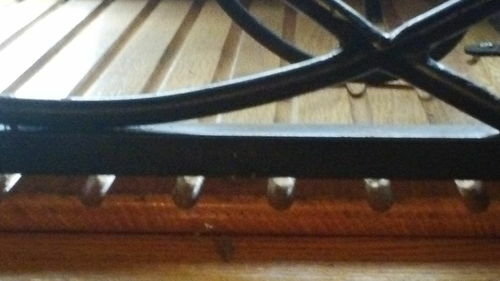 By rounding the top of the cleats slightly (think rocking chair rockers but not that drastic) you can add pressure. If one side is more warped than the other you can put different pressure on each side. To figure out the optimum size of the cleats take the lid off the hinges and clamp cleat material underneath. (be sure to pad the top against the clamps) you can check for flatness with a straight edge and change the pressure until it’s right. Off the wall option would be to match the curve on the box sides and make it unique. You could still flatten the top of the lid. The top is flatsawn and just did what flatsawn wood will do. the finish had nothing to do with the wood movement or lack there of. I agree with the idea of adding cleats but you have to install them so you allow for wood movement. before installing the cleats put elongated holes in the cleats placed so they lid can expand across the grain then screw the cleats on but do not glue the cleats. 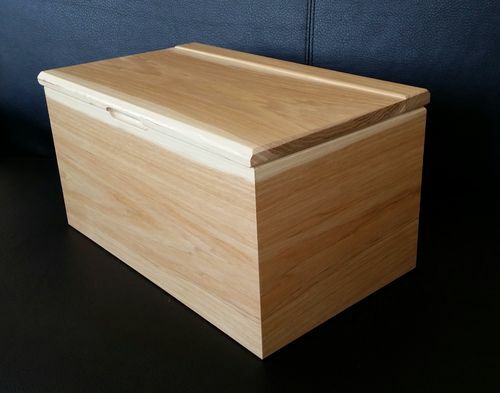 Next time you make a lid or top you might want to check the moisture content of the wood and or use 1/4 sawn wood for the top. Nice looking chest. I like the way the sap wood was integrated into the build. You obviously spent some time planning the use of your material. I think the problem is a differential moisture problem; too much moisture in the surface on the underside of the lid versus on the outer surface. This is likely due to more moisture leaving the upper surface than from the lower surface. Cleats may work to bring it back to flat and this can be determined by EricTwice’s method. But if the cleats fail to work, a more radical approach could be taken. The first step would be to coax the lid back to flat. The lid could be removed and set aside or left wide open hoping that the moisture level of the upper face of the lid will equalized with the moisture level of the lower face. This could take several days or longer since 4 coats of poly will impede moisture exchange. If the lid remains cupped, the finish could be removed and then set aside to flatten. Some moisture could be applied to concave side (the face that is drier) after finish is removed if simply allowing the lid to rest does not work. Once the lid is as flat as you can get it, some relief cuts with a core box router bit on the underside of the lid could be introduced. These could be a series of parallel slots about 2” apart running parallel to the grain and at a depth of about ¼” (for a ¾” thick lid). The relief slots should help keep the lid flat. Cleats could be added but may not be needed after making the relief cuts. But if people will sit on the lid, adding two or three cleats for added strength might be worthwhile. The relief cuts, being visible of the ends of the lid, would change the appearance of the project. The relief cuts would make it more difficult for the lid to cup and would introduce a little air flow on the underside of the lid. I am not sure how effective the relief cuts would be or whether the cuts would become problematic if the relief cuts are stopped cuts; not running all the way to the ends of the lid. I was told after having the same happen to me that the general consensus is that anything resawn to half of its thickness will warp. Mine warped over night and it was 3/4 maple from an almost 2” slab. Sand the underside, particularly in the area where the bow begins to lift. All else being equal that should flatten it. This worked for me on a box lid that curled up.